It wasn’t easy getting to Jordan; the winds were high, and the ferry delayed. In fact, our ferry from Nuweiba, Egypt, to Aqaba, Jordan, sat out on the Red sea overnight. The only thing worse than waiting, waiting, waiting must have been sitting out on that ship—seasick, seasick, seasick. We got to the ferry landing about ten o’clock Monday morning and waited all day. The back window of our van exploded (high winds? ), and Mollie, Allana, and Leslie treated us to a hilarious sock-puppet show in the empty back window. “Put a sock in it!” “Do they let Red Sox into Jordan?”, “Once again, you’ve put your foot in your mouth!” What joy to travel with young people. We finally gave up waiting for the ferry at 6 PM and found ourselves rooms at a quaint beachside hotel where they treated us like royalty. After a delicious Egyptian dinner, our host encouraged us to check out the beach (VERY windy), where we discovered a thatched-roof, adobe-walled disco that became our home for the night. Our waiter spun the tunes and played the lights, while the owner pulled out water pipes. The chef grilled corn and sweet potatoes and brought out spiced nut and bean snacks. We danced off our huge dinner, then laughed ourselves silly at the cross-dresser-belly-dancer. Leslie raved, “I had a crush on him before his act, but now I’m CRAZY about him!” Too funny! We finally boarded the ferry the next day after waiting in the station for three hours. We waited two more on board as they loaded, took three hours crossing, waited another hour to disembark, and stood yet another at customs—10 hours! Passport distribution in Aqaba was a joke. A guard read off passport names one-by-one as he held them aloft for anyone to grab. ARAUGHHH!!!! One of our travel companions quipped, “They couldn’t make this system less efficient if they tried!” Too true. On Wednesday morning we finally made our way to Wadi Rum, a desert preserve in southern Jordan. It was BEAUTIFUL! We rode on benches in the bed of a 4-wheel-drive Toyota pickup, soaking in the moonscape terrain. We’d been outfitted in Arab red-and-white scarves, protection from sun, wind, sand, and cold as we raced across the sands. We explored the steep dunes barefoot, racing down and trudging back up. We drank Bedouin tea and relaxed with a HUGE outdoor lunch of countless dishes, my favorite a grilled eggplant salad. My goodness, it was GOOD! For about ten dollars we ate like kings. There were two other things I loved in Jordan. The first was Petra, which must be seen to be believed. The most impressive scenes of Indiana Jones and the Last Crusade were filmed there, and I felt like an ancient explorer stepping into a secret world. Petra is a hidden valley in southwestern Jordan with spectacular classical facades carved right into the valley’s sandstone cliffs (by the Nabateans and the Greeks, for the most part). It’s spectacular, especially after hiking through the Siq, a narrow rock gorge (1.2 K long and 3 to 12 meters wide) that serves as the main entrance to the ancient city. Our guide, Mahmud, pointed out niches and carvings as we strolled down the Siq, but I’ll never forget my amazement as we viewed the impressive 3-story treasury building through the slit of rock ahead. Amazing! We were awed at the many structures carved from the rock walls of Petra, but the most fascinating part of the day was our guide. 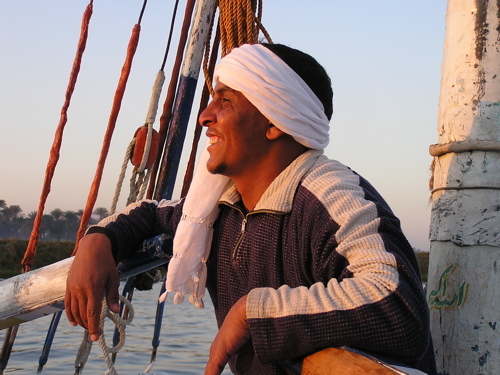 Mahmud had grown up a Bedouin shepherd, shoeless and with one set of clothes. He shared many stories of growing up in a Petra cave, moving to the desert for the summer. His father had chosen him, the middle of nine children, to attend school in the winter. Mahmud hadn’t wanted to leave his world of goats and camels, but his father urged him to travel the 15 K to school, each morning saying, “just one more day.” Day after day, Mahmud hiked up the Siq and found a ride to school. 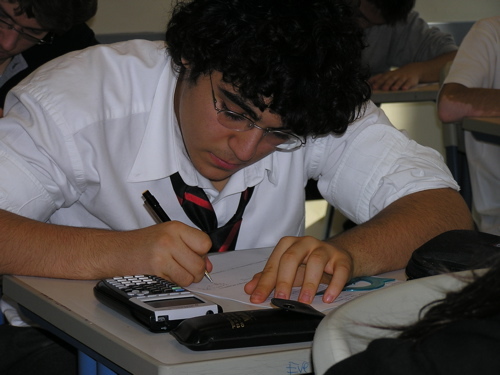 Obviously a very bright man, he had been singled out by King Hussein as one of the top students in Jordan. He told of his anxious trip to Amman to meet the king, who paid for his high school education in England and university in Amman. “I was the only one of my siblings able to get an education,” he told us apologetically. “We all still struggle with the cultural shifts. My mother still lives in a tent, though the government has built her a house. When I’m feeling stressed, I visit her and find great peace in the smells of my childhood,” he said. Mahmud now has a wife and three children, and he feels stress about providing for them, just as his parents did. So many stories, and so little space to share them. Our last adventure was an afternoon at the Dead Sea. My goodness, if you ever wondered what it’s like to be a cork, go to the Dead Sea. It’s the most dense, most saline water in the world. While most oceans have 3.5% salinity, the Dead Sea has 30%. A jump into the Dead Sea evokes immediate hysterics, let me tell you. I never imagined it could be such a hoot to lie on TOP of the water, rolling like a bobble toy. You can lie in the water with arms and legs up in the air and STILL float! We met a film crew slathering themselves with Dead Sea mud along the shore, so of course we joined them. It was a blast, and Allana agreed to being buried in the heavy black stuff. (Of course, our skin is now beautiful.) People pay thousands of dollars for the same treatment, and we got it for free, including laughter therapy. Well, all good things must come to and end, and we eventually left the water (and mud), said goodbye to Jordan, and flew back home to Istanbul. I do love this life! Ask me why I never realized that Mount Sinai was in Egypt. Never a great geographic or Biblical scholar, I still could have figured it out. I knew that Mount Sinai was the site of the burning bush where Moses received the tablets of the ten commandments as he led his people out of Egypt. Sinai peninsula—yup! Our well-loved guide Moustafa met us at the Sharm el Sheikh ferry station and brought us to Dahab, a popular Red Sea diving community. We stayed in a luxurious beachside hotel, where we took full advantage of the pristine beaches and sunshine. We’d be leaving to climb Mount Sinai at 2:00 AM so we could experience the night sky and the spectacular Sinai sunrise. We climbed into our van bleary-eyed, shocked that we had our own private security guard, Khalef. He was a clean cut young man sporting a formal suit, and we didn’t realize until two days later that his jacket concealed a considerable weapon. He charmed us through five (count them) security roadblocks, one where we had to show our passports. Mount Sinai is well-protected. Just our luck, the weather had turned cold, and St. Catherine’s Monastery at the foot of the mountain would be closed (Sunday), so there would be few hikers on a trek usually made by hundreds. When we were told that the peak was snowy, my warm-weather friend Terri announced, “I have no burning desire to do this climb,” and returned to the van to sleep for the six hours we’d be gone. The rest of us donned our warmies and started up the wide, dark, rocky path. Our Bedoin guide, Mahmud, often climbs the mountain two or three times a day (6 K each way to the 7,498 foot summit) . We smelled camels and were offered camel rides from the darkness, but we refused. It took us a while to get used to the slope, and breathing was hard. The cold was shocking, too–about five degrees Fahrenheit with a major wind chill. Quite a change from lounging on the beach that afternoon. We were FREEZING! Moustafa had never climed Mount Sinai and he’d never seen snow, so when spots of white appeared along the path, he was excited. Within an hour of climbing our shoes were soggy from the ever-increasing snow. Rock hut refreshment stops are scattered along the path, but most of them were closed. About halfway up the mountain, Mahmud led us into a hut and lit a lamp. Lo and behold, there was a young Bedoin man curled up under blankets in the corner of what seemed like a little corner store, complete with a gas burner. Moustafa treated us to coffee, tea, and candy bars while we chatted with our guide and his friend. Once again warm, we braced ourselves to continue our trek, which grew steeper, icier, and more difficult. Determined to get to the top, stars or no, we picked our way carefully up the mountainside, avoiding icy spots. We had flashlights, and the moon cast a pale glow through the fog and snow. I thought we had 149 rock steps to climb near the summit, so you can imagine my dismay when I learned there were 749. Mahmud called them the Steps of Repentance, and believe me, I repented every stupid thing I’ve ever said or done. That’s a LOT of steps (and I’ve done a LOT of stupid things). Actually, there’s another route up Mount Sinai, 3750 steps straight up the mountain, built by a monk as repentance for his transgressions, (which must have been considerable). Imagine how much repenting you’d do on THOSE steps! Along the way we came across a small group trying to revive a man who had passed out from the altitude. THAT was a bit unsettling, but our guide seemed unruffled, so we continued. We saw the man later, helping a woman as she slipped down the path. Unfortunately, a number of hikers were underdressed and wearing slick (though fashionable) footwear. Oops! In any case, we finally made it to the top, where there’s a small mosque (12th century) and the Chapel of the Holy Trinity. A group of young Egyptians were huddled under blankets on the lee side of the chapel, and they invited me to join them. They enjoyed practicing their English, and I found them very entertaining. The sun rose while we were on Mount Sinai, the only sign a hint of light through the enveloping clouds. We shivered at the summit for about 20 minutes, then headed back down. Sun peeked through the clouds a few times, and the girls attacked Moustafa with snowballs. He was a fast learner and insists that he won in spite of getting snow down his neck. It’s a guy thing. When we finally got to the bottom, Moustafa negotiated a private tour of the St. Catherine’s Monastery to see the reputed Burning Bush, a huge weeping rosebush. The monastery houses a Christian church, a Jewish synagogue, and a Muslim Mosque. All three faiths share the Old Testament, and at least in that one monastery, they cohabit peacefully. Would that it happened everywhere! 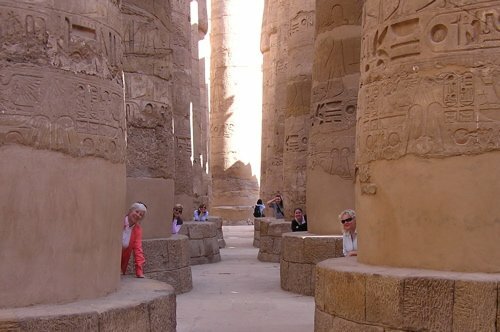 (on a cruise ship), and the Sinai peninsula, which was my favorite. enough to remember Johnny Carson. Nile. 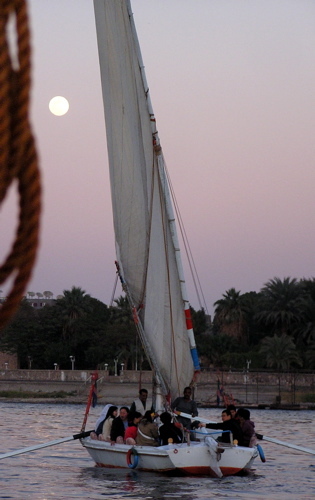 A felucca is a fairly primitive sailboat used along the Nile. 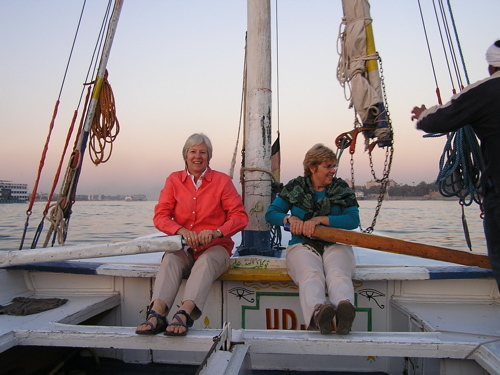 felucca on our own. We did that before checking the wind. DUH! away, he agreed to it. Business was slow. confident that we’d get a tow. Nope. hopped off the boat, and began TOWING us along the shore. We felt terrible. was determined to get his fee–and to get us to the promised Banana island. became quite a production. Who could resist? intrepid hero jumped back into the water and manned a new tow rope. pulled his jeans back on and escorted us up a path away from the water. board for serving, and he spooned in sugar from a china sugar bowl. endless time cleaning up, tying up the sail, putting his shirt back on, etc. We were pretty astonished when he pulled out the oars again. the nile. Fortunately, this trip was downstream, so it wasn’t as strenuous. There was no towing, just rowing. we had a delightful adventure, and he was well paid. Everyone was happy.